Every year, wildfires clear millions of hectares of land and emit around 34-percent of global soot mass into the atmosphere. In certain regions, such as Southeast Asia and Russia, these fires can contribute as much as 63-percent of regional soot mass. In a paper published in Nature's Scientific Reports, a team of scientists led by Rajan Chakrabarty from Nevada's Desert Research Institute report the observation of a previously unrecognized form of soot particle, identified by the authors as "superaggregates," from wildfire emissions. 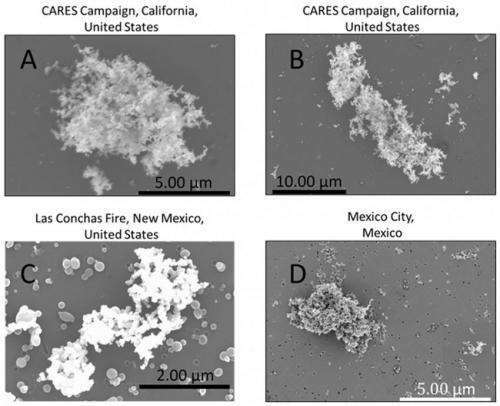 These newly identified particles were detected in smoke plumes from wildfires in Northern California, New Mexico, Mexico City, and India. For several decades, scientists have been trying to quantitatively assess the impacts of wildfire soot particles on climate change and human health. However, due to the unpredictability of wildfire occurrences and the extreme difficulty in sampling smoke plumes in real-time, accurate knowledge of wildfire-emitted soot physical and optical properties has eluded the scientific community. Unlike conventional sub-micrometer size soot particles emitted from vehicles and cook stoves, superaggregates are on average ten times longer and have a more compact shape. However, these particles have low effective densities which, according to the authors, gives them similar atmospheric long-range transportation and human lung-deposition characteristics to conventional soot particles. "Our observations suggest that we cannot simply assume a universal form of soot to be emitted from all combustion sources. Large-scale combustion sources, such as wildfires, emit a different form of soot than say, a small-scale, controlled combustion source, such as vehicles." says Chakrabarty, who also holds a faculty appointment at Washington University in St. Louis. The study points to the need for revisiting the soot formation mechanism in wildfires, he adds. The multi-institutional research team first detected the ubiquitous presence of soot superaggregates in smoke plumes from the 2012 Nagarhole National Forest fire in western India. To verify the presence of superaggregate particles in other fires around the world, the team next analyzed smoke samples collected from the 2010 Millerton Lake fire in Northern California, and the 2011 Las Conchas fire in New Mexico, as well as wildfires near Mexico City. The authors found that a large portion of soot emitted during the flaming phase of these fires were superaggregates. To assess the potential impact of superaggregates on global climate, scientists also calculated the radiative properties of soot superaggregates using numerically-exact electromagnetic theory. "We found that superaggregates contribute up to 90-percent more warming than spherical sub-micrometer soot particles, which current climate models use," said Chakrabarty. "These preliminary findings warrant further research to quantify the significant impact these particles may have on climate, human health, and air pollution around the world."